Made with the Rich and Delicious Premium Swiss Milk Chocolate! Designs are shown in white for ease of viewing purposes. SG402 ORDER Designs displayed are to show font collection. Layouts are the same formats. We may be able to match your invitation font! SG404 ORDER Please ask us if you do not see a font that matches your invitation. Also great on: Wine glasses, stationery, invitations etc. Pricing: Prices reflected on this site are for designs as shown. Custom designs that differ from the samples (other than personalization and text changes) require a $25.00 set up charge. 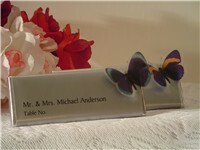 Set-up: In order to keep the guests names printed as large as possible, we use an ampersand (&) between Mr. & Mrs. If you require 'and', you must special request this. And please note, that using 'and' spelled out may make the name print smaller. For lines with 'and Guest' we use the 'and' spelled out. information: Order processing time is normally 1-3 weeks Orders should be submitted as early as possible. Orders which must be processed within 7 days prior to 'receive by' date are subject to a $15.00 RUSH order fee. If you chose to submit your list in MS Word or in an e-mail, there will be a $15.00 set-up fee. If you require us to type your list, there is a $15.00 plus $0.25 per name set-up fee and and an additional 2 week lead-time is required for proof approval. Font: Certain fonts do not work with certain designs. Butterfly/Formal: The 'Butterfly / Formal' designs are meant to be used with or without the butterfly. They are Elegant and Formal either way. for coming to share our day with us! Your presence made it extra special! 2. Thank you for sharing the day with us! us on our wedding day! Your presence made our day complete! for sharing our special day with us! or 2¼ oz. 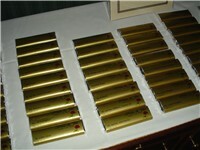 Premium Milk Chocolate bar! Lay them flat or stand up with mini stands! Return to SeatingGreetings.com Seating Greetings Catalog TOP. New bar sizes! Call for more details! or any event where a place card is used! "I cried the day I received my order! Literally. They were the first completed item I had from all my wedding plans and I cried tears of joy. They were perfect!" --Michelle P.
An elegant way to greet your guests and express your gratitude upon their arrival your reception! SeatingGreetings is a division of Personalized by Design.